Winery Dogs bassist Billy Sheehan is a legendary musician who continues to record and perform with no plans of slowing down anytime soon. He is best known for his work with David Lee Roth band having played on David Lee Roth’s first two albums Eat Em’ and smile and Skyscraper , Mr. Big, and The Winery Dogs. Billy has won numerous awards as a bass player. Angel Alamo: How is the tour with Winery Dogs going? Billy Sheehan: Absolutely fantastic! Having a wonderful time. Angel Alamo: How is it for you playing with a new musicians. You played with Richie Kotzen in Mr. Big. Mike Portnoy you have never played with in a band? 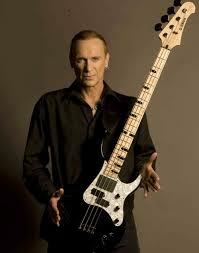 Billy Sheehan: I’ve played and toured with Mike & Richie in other situations many times in the past. The three of us are having a blast with the onstage chemistry that happens within the band. It makes every night something to look forward to. Angel Alamo: What are plans for the winery dogs after the tour is over? Billy Sheehan: We don’t plan out much of anything ever. As soon as we can, I’m sure we’ll write and record more, then tour more, then repeat—however, we will only do it when we feel we can do the best, and most inspired work together. We don’t want to force it. Angel Alamo: Would winery dogs or you as as a musician ever do an acoustic show or album? Billy Sheehan: Not sure. Maybe me, do not know about TWD. I love playing live at full energy. It’s exciting to me. An acoustic show is a little toned down. Angel Alamo: It’s been 25 years since Mr. Big released Lean Into It album. Was there any pressure for the band to produce a hit record? Billy Sheehan: None at all. The next album, yes, but not on “Lean Into It”. The record label fought that record from the start. We had a hit in spite of their best efforts to stop us. Nice. Angel Alamo: Was Mr. Big surprised by the success of the album Lean Into It? Billy Sheehan: Certainly. We believed in the record wholeheartedly. But the label did not, so it was a surprise to do so well with it. Angel Alamo: Is there any album from your career that you consider a favorite album? Angel Alamo: Is the eat em and smile reunion show happening at some point? Billy Sheehan: I sure hope so. I would love to. Angel Alamo: What are your favorite places to play live? Billy Sheehan: Anywhere and everywhere. As long as the audience is pumped up, it doesn’t matter. The audience makes the show. Angel Alamo: Is there still a city, country, or venue that you would like to perform in that you haven’t already? Billy Sheehan: Actually, no—surprisingly. But I LOVE to play live, and I LIVE to play live. So I’ll play anywhere that will have me. Angel Alamo: At this point where you have been able to do it all in your career. What keeps you going in your career? Billy Sheehan: I’m a musician first and foremost. There are always new challenges and new mountains to climb. It never ends. There’s always more to know, more to learn, more to experience. It’s still exciting to me—even more exciting than when I first began. Angel Alamo: Is there anyone you still hope to work with? Billy Sheehan: Probably—can’t think of anyone at the moment. Sorry. Angel Alamo: Are there any new bass players out there that you enjoy listening to? Billy Sheehan: Tons! But I mostly listen to bands and songs, rather than just a bass player. Angel Alamo: What advice would you give to anyone wanting to pick up a bass guitar and play?